The topic of whether to open Portage and Main to pedestrians has surfaced once again. It comes after Calgary Mayor Naheed Nenshi had trouble finding his way out of the underground walkway. Nenshi is visiting Winnipeg as one of hundreds of delegates attending the 2016 Federation of Canadian Municipalities conference at the RBC Convention Centre. For the past 40 years, concrete barriers have prevented pedestrians from crossing Portage and Main. Instead, people are directed to walk underground. Nenshi found out Wednesday that's easier said than done. "I went underground and attempted to follow the signage,” said Nenshi. “I was very excited and found a way back to life again and popped up to realize I was on the same corner that I had entered on." Overall, he says his impression of downtown Winnipeg has been positive, except for his experience at Portage and Main. "I've seen pedestrian unfriendly environments before, but that's a pedestrian hostile environment." Nenshi said he hesitates to get involved in other cities’ political issue, but in this case he felt an outside opinion may be helpful. During a media scrum, Winnipeg Mayor Brian Bowman talked about the difficulty Nenshi had crossing the iconic intersection. "Nenshi, he got lost trying to cross," said Bowman. "He went down to the tunnels. He was a thousand per cent lost and really struggled to find his way to the surface." "If you ask people that have been down there what their experience has been like, it's not as favourable as it should be," he said. "I think we can do a lot more with Canada's most iconic intersection." 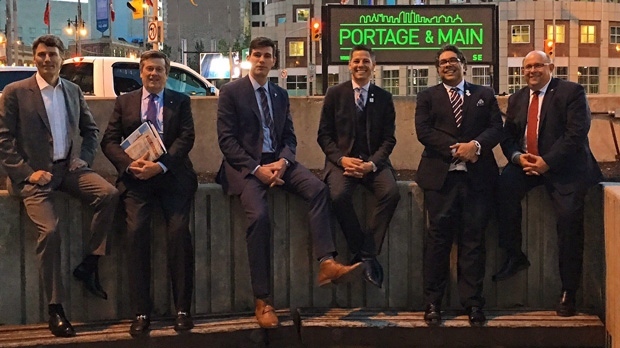 Bowman said he took the big city mayors for an impromptu walk and Portage and Main was one of the stops on their tour. "We did walk around Portage and Main and some were just shocked that you couldn't walk across Portage and Main," said Bowman. "We had a discussion about the history of that intersection." "There was unanimity from all that were walking with us that it's ridiculous, in this day and age when you have so much positive growth going on around that intersection, to not open it up to pedestrians." Bowman hopes the intersection will be open to pedestrians in advance of the 2017 Canada Summer Games which is being hosted by Winnipeg. "We've got a lot of work to do in the meantime and we're working diligently right now on getting that intersection open to pedestrians in advance of hosting Canada once again," said Bowman. "We are having good discussions with the property owners and we're making really good progress on that."